Welcome to our Coral Cottage! The Coral is our newly renovated compact studio that has a queen size bed, no kitchen but a small refrigerator, microwave, coffee maker, TV & dvd player, wifi, 2 cruiser bikes and helmets, 2 boogie boards, cooler, 2 beach towels, 2 beach chairs, all linens and towels, books, DVDs, magazines, iron, ironing board, hair dryer, and outdoor sitting and grilling area. 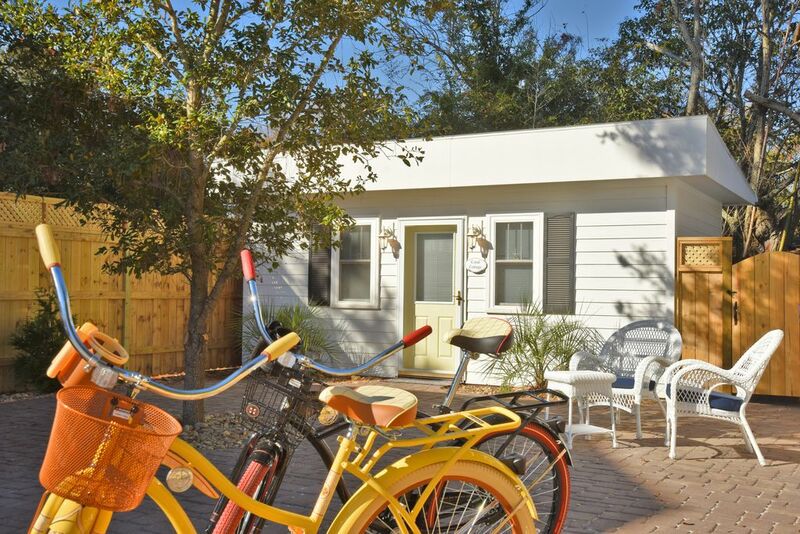 Enjoy walking or riding Coral Cottage’s cruiser bikes all over town! There is one private parking space provided with the Coral Cottage. Our insurance requires that there is NO SMOKING within any of our cottages. Please note that our rates will be changing after May 14th, 2018. Adorable and well appointed! Perfectly close to all the downtown activity. Highly recommend! We stayed in the smallest of the cottages. You must be close to whomever you stay with as it’s only one room but it is just lovely for a couple or single person. The bikes are are wonderful addition and the shared space is great. We where able to ride bikes to town. Grill out and so much more. Only enough parking though for 1 car per cottage. We had friends that wanted to visit but no where for them to park other than that. Everything was great. We loved staying in this quaint little cottage! Size, space, and amenity wise the cottage is similar to a hotel room. There is a bed, a chair, a dresser with a coffee maker, a full bathroom. Then the closet has a mini fridge and microwave along with a few kitchen essentials and other amenities like beach towels and boogie boards. But the greatest part was no upstairs neighbors, or having to be mindful of neighbors below you. The other cottages are far enough away we only heard a door close once. A wonderful patio out front to enjoy the outdoors. We will stay again! We very much appreciate the kind positive detailed feedback as it relates to our Coral Cottage! It makes us very happy to see that our guests have such a wonderful time! We work hard to ensure that all details / amenities are available to our guests (from booking, to their arrival and the duration of their stay) so they may have a memorable vacation! We value our guests and their feedback and are grateful that they take the time to write a review! We very much appreciate the kind positive feedback as it relates to our Coral Cottage! It makes us very happy to see that our guests have such a wonderful time! We work hard to ensure that all details / amenities are available to our guests (from booking, to their arrival and the duration of their stay) so they may have a memorable vacation! We value our guests feedback and are grateful that they take the time to write a review! Charming cottage within walking distance of Beaufort waterfront. Coral Cottage is cozy, clean, and tastefully decorated. The outside sitting area is well lit, as is the labeled parking space. It's location is well within walking distance of many great restaurants, shopping, and the waterfront. We very much appreciate the kind positive detailed feedback as it relates to our Coral Cottage! It makes us very happy to see that our guests have such a wonderful time! We work hard to ensure that all details / amenities are available to our guests (from booking, to their arrival and the duration of their stay) so they may have a memorable vacation! We value our guests feedback and are grateful that they take the time to write a review!